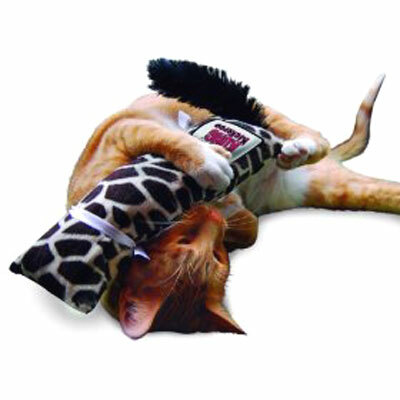 19+ Best Interactive Pet Gifts: Toys For Cats, Dogs, Horses, Birds, Ferrets and Fish! This being my cat's favorite toy, I naturally have to share it with you. Because he loves it so much, I reviewed the toy here. See the video in the review; you won't believe how much cats love the Fling-ama-String. Amazing toy. Cats are immediately drawn to this toy -- I guess it's the powerful catnip -- but they don't let go of it! I covered this toy recently in another column; you can click here to read the article, or go to Amazon.com to purchase. It's so worth it! 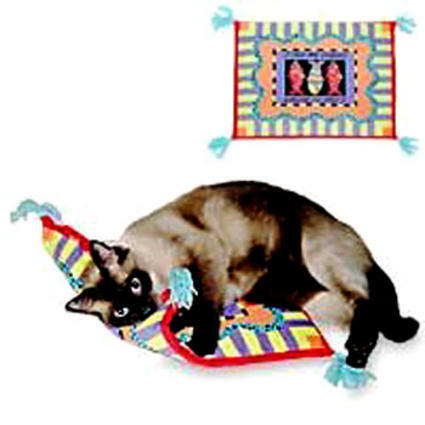 Believe it or not, what with all of the cat-teaser toys on the market, with feathers, boas, ribbons, cords, and whatnots, Da Bird cat teaser is favored by the majority of cats who've rated it. 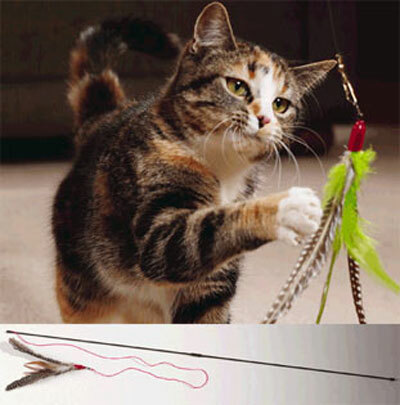 Maybe it's the longer (36") wand, or the sound of the feathers in flight, or the fact that the feathers are real bird feathers... whatever does it, your cat will be addicted. Owners advise against leaving your cat alone with this toy. Sold by Amazon.com for $10.98. Don't you sometimes wish you were a cat? Cats really know how to find all those feel-good spots. And the Hagin Catit Cat Spa knows where they are and how to reach them. 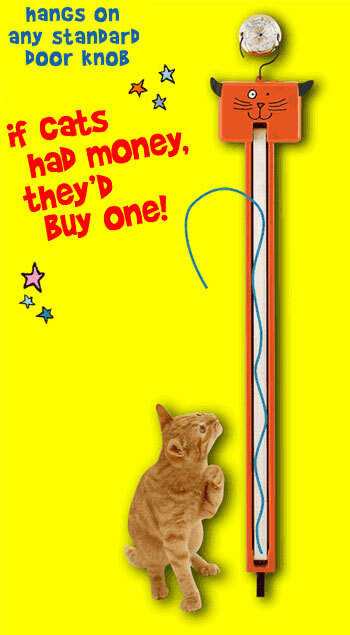 After all, there's nothing like a 'feel good' toy for a cat. With the Body Groomer and the Ripple Massager for rubbing the face, head and neck, those especially hard to groom places for a cat, he'll groom himself and stimulate lots of pheromones to calm him. 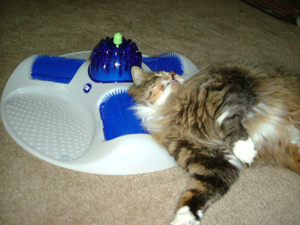 The Accu-Pressure pads provide your cat stepping places she loves to stimulate her paws. And cats love their gums stimulated. I've been massaging my cats' gums with my fingers, but the Cat Spa Gum Stimulator offers cats something to actually gnaw on.. which does not feel good on your fingers. (There's a place for catnip in the gum stimulator, so she'll be more inclined to chew on it.) 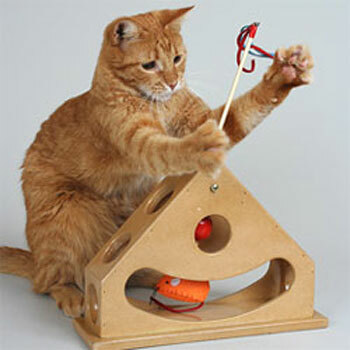 All of this in one toy will keep your cat busy. Gift available at cat places and Amazon.com ($24.97). Pet Quirks has some definite winners in their Babble Balls. The Babble Ball for kitties is 2.125" diameter and nice and ridged for some gum stimulation, if desired. The Babble Ball makes cat-appropriate sayings whenever your cat comes near it or so much as breathes near it. Surprise! What was that!? 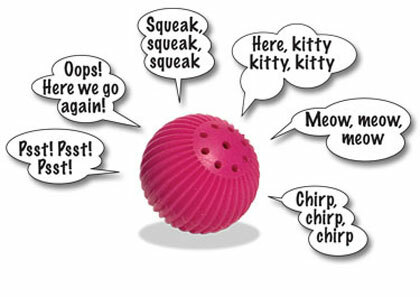 Hear the Babble Ball for Kitties at Pet Quirks. Available for order at Amazon.com for $6.90. When the pendulum swings on the Tick Tock Teaser, your cat will have two problems to solve: how to stop the pendulum and how to catch the little toy prey inside this wooden box. If she does catch it, and bores of it, as kitties do, you can exchange the inner toy for another, by inserting a new one with Velcro. And it always helps to stuff the toy with fresh catnip. Nice looking, sturdy box that promises lots of fun for da cat. Gift available at Amazon.com for $15.89. Ever see your kitty get down and boogie? You will if you get her a boogie mat from Fat Cat! This mat's full of Fat Cat's extra-special blend of cat nip! Re-chargeable when ready! From Amazon.com, $8.49. 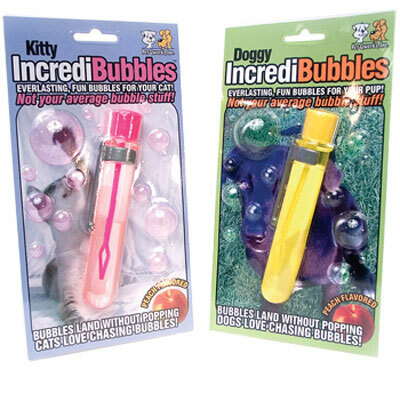 What a kick the Pet Qwerks' Incredibubbles are for dogs and cats; heck, they're great for kids! Why? They last longer than your average bubble, hitting the ground in tact so your guys can chase them for awhile. 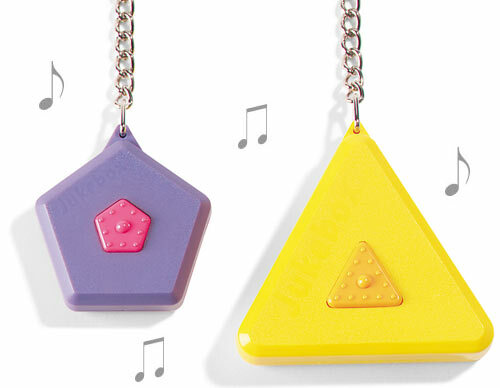 These are non-toxic and peach flavored. You too will have fun with these; you might even get your nose wet! Available at Here's To Healthy Pets for $3.99 and at Amazon. What's fair for the kitty is fair for the dog.. no? Indeed the Doggy Babble Ball does exactly what the Kitty Babble Ball does... stimulates his curiosity as it interacts with your dog. As soon as it gets a whiff of your dog's breath or he touches it, it talks to him! Available in three sizes and in two versions of babbles -- animal sounds or human expressions. 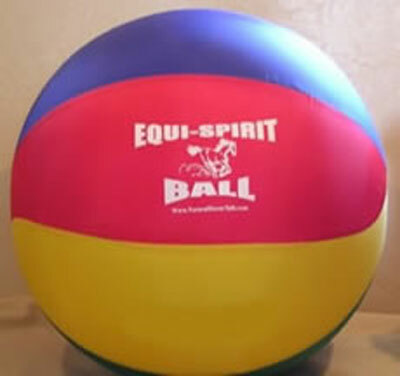 The Babble Balls are made from a high impact plastic and have replaceable batteries. All versions are available for gifting at Amazon.com from $5.99. Want more information about Babble Balls? Visit their manufacturer, Pet Quirks. Put some odorous dog treat in the Twist & Treat and your dog will keep busy for awhile, especially if she's hungry. 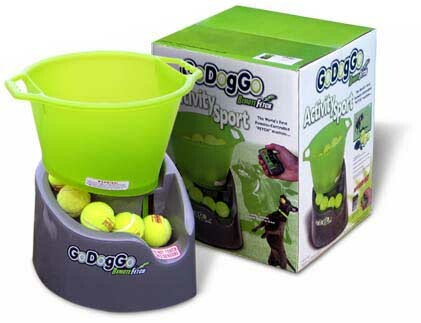 Made in two parts from durable rubber, it can be filled with treats of various sizes. Then twist the parts closed and, voila, your dog will be challenged to get to the treats. The degree of challenge is up to you, as you can adjust the size of the toy's openings. 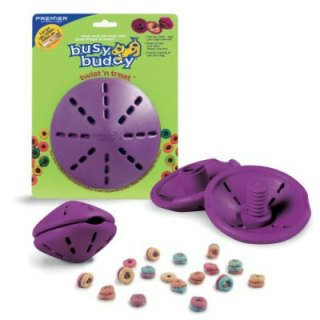 The Busy Buddy Twist & Treat is giftable from Amazon.com for $6.99. GoDogGo is the ultimate couch potato's dream... if he has a dog. Just plug this in and let your dog do the rest. Oh, yes, you have to hang around to push the button on your remote control, but just think you can do this from a patio lounger! GoDogGo is $149 well-spent dollars, when you figure how much exercise you don't have to get. Here's a great video on GoDogGo from YouTube by "agilitymanque." For some neat owner- participant dog toys, please see my blog, 4 Ways To Play A Spit-less Game Of Fetch With Your Dog. Perhaps more than cats, dogs, horses, or ferrets, domesticated birds are quite happy playing by themselves. So, almost all bird toys are interactive. 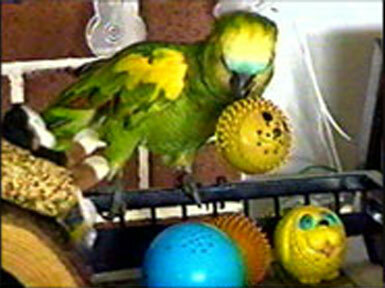 Many objects around your home, even small toys for other pets, can easily convert to a "bird toy." There are plenty of CD's that you can play for your bird to teach him to sing or talk; frankly, I've not had any success with them. But the Sing-A-Long Jukebox is a toy your bird can play for himself. A little exploration will lead him to a button that plays one of four tunes on the Jukebox. Once he learns he can activate the toy, he starts listening and responding to it by whistling himself. And when the tiunes start driving you crazy, you can purchase new modules with different tunes.e tunes. Listen before you buy at Doctors Foster and Smith starting at $10.49. 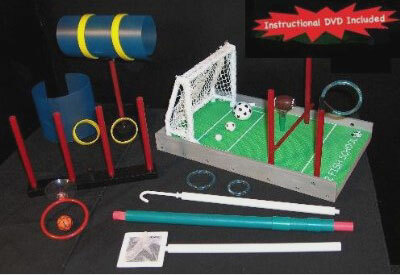 Believe it or not, you should be able to teach your pet fish how to jump through hoops and throw balls through them too with this training kit. in fact, there are about 10 tricks to teach your fish in the RB Fish School Kit. To see my full-length column about the RB Fish School, click here. You will find an amusing You-Tube video of a trained goldfish. This looks like a fun way to spend one's day... like trying to navigate the Los Angeles freeway system. 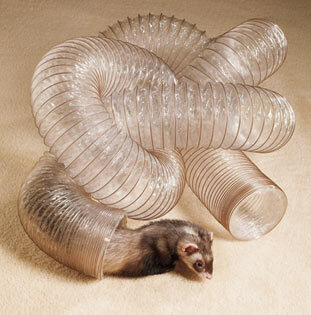 But ferrets love this toy, and if you're into ferret racing, buy one for each ferret. Available from Amazon for $17.99. This fleecy nest offers sleeping and peeking opportunities for one or multiple ferrets. 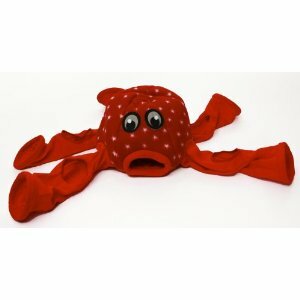 Made with extra strong seams to resist tearing, the Octo-Play may be hand washed or dry cleaned. A wire insert keeps the dome from collapsing down and is three inches high. Carried by Amazon.com for $13.78. 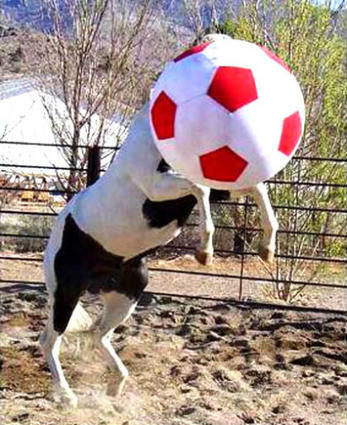 There are nine more interactive toys for horses covered in another column I wrote, entitled Toys For Horses Relieve Stall Stress, so please visit, or re-visit, that column for a great selection of horse toys. 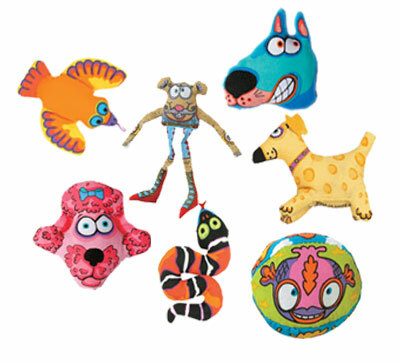 There's a lot to search through when it comes to pet toys. Like many products, every toy claims to be a dog's, cat's, or horse's best friend. I hope I made gift selection easier for you this year by "ferreting" through the offerings. Have a happy and safe holiday season with your family of humans and pets! Great News For Chocolate Lovers: New Study Tells All! I love the idea of the Twist & Treat! I had something similar to this for my dogs (but one that couldn't be amended), 1 dog loved pushing it around, the other (who is a nortorious chewer) just wanted to knaw on it. Unfortunately, that resulted in a large hole and a useless toy. I have an impossible time finding truly indestructible toys for that dog...I'd be great if maybe you could feature them in the future. I've heard from other owners have had luck with the MuttMop and I've just ordered a couple to see if these will actually last. I'll let you know!